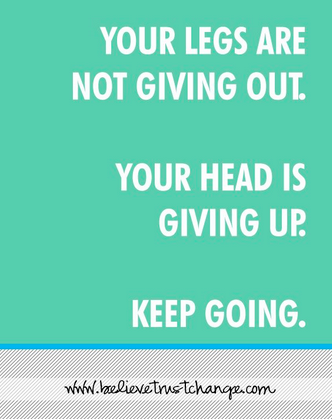 Your legs are not giving out, your head is giving up. . . keep going! I find myself repeating this mantra over and over again during these times. Especially last Sunday when I decided that for my first Yoga class in like 3 years I would attend Yoga Tone, having no idea wha that entailed. And when I say first class in three years, 3 years ago I was attending beginning Yoga at the University rec center where frequently football players would join and fall asleep in the middle of class, not exactly the most difficult of yoga times. So into yoga tone i went grabbed my 3 and 5 pound weights, Inner monologue – Weights why do I need weights for yoga isn’t this supposed to be peaceful. Walked past the “Silence in the studio sign” and Oh God I am not peaceful enough for this and rolled out my rented mat sat down, silently of course and waited for class to start. All was well until we busted out the weights about halfway through the class and I thought I was going to die, stomach churning, legs shaking, brain screaming kind of pain, but in a class of 5 you can’t just stop. Needless to say I did not come out of it feeling more at peace and in tune with my Yogic Breathing, But I was stronger, and more sore, for the next three days or so. But stronger and I could feel it. It felt good enough to go back, the next day, and the next day. Not to yogatone specifically that I need at least a week break from but to a class. I hope that if you are like me and fear looking like an idiot or like someone will criticize you for being new to _____ insert exercise here, that you will do it. Fight that voice in your head that says you can’t whether it is a mental block or physical get out there, do all that you can, find the time in your busy schedule even if it is just 15 minutes to move. Find that yogic breathing, or get out there and hit something ( boxing is my favorite workout) because as much as we think people care, they don’t have time to judge you when we are all so busy being self conscious about ourselves. 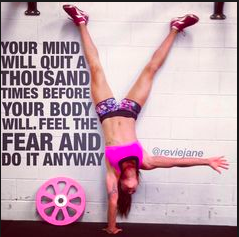 So do it for you. . whatever it is you have been thinking about. . . You will be better for it. I can feel the burn in my legs, the same as when I run and I can feel myself, my mind and my body getting better. So thank you Nike I am not sure I will start buying for clothes or shoes but I know that I am . . .